Assam, an important northeastern state is famous for its tribes & sub tribes, silk handlooms, evergreen tea gardens, endless stretches of paddy fields, scattered with groves of coconut, banana and areca nuts trees. Today, Assam is one of the developed states of India which has retained its rich culture and tradition, be it in food, clothing, religion and more. 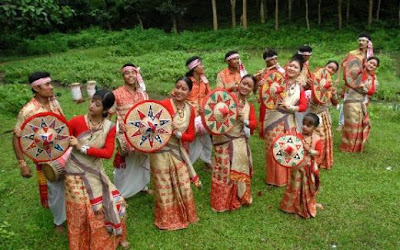 The traditional dress of the Assamese women is known as “Mekhala and Chadar”. 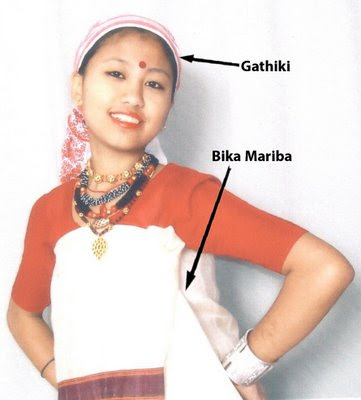 Mekhela is the long skirt which is worn with an upper apparel, known as “Riha”. The bottom of the Riha is artistically decked with intricate red colored designs. This gives a graceful appeal to the complete apparel. During Bihu, the grand festival of Assam, the women dress themselves in traditional outfits made up of Muga silk also known as Golden Silk. The traditional outfit for Assamese men is white “dhoti”, shirt known as “Sola” or “Fotua” with a shawl known as “Eri-Chaddar”. While working in the agricultural fields they wear a hat known as “Japi”. The traditional dress of the Assamese women is known as “Mekhala and Chadar”. Mekhla is the skirt and Chadar the upper wrap. Assamese women, irrespective of their differences in tribes and clan, wear variations of this dress. This gives a graceful appeal to the complete apparel. The men of Assam dress themselves in Dhoti (a loin cloth) and Chadar, made from Endi (a material made from a blend of silk and cotton). The Gamosa is an article of great significance for the people of Assam. Literally translated, it means 'something to wipe the body with' (Ga=body, mosa=to wipe); interpreting the word “gamosa” as the body-wiping towel is misleading. It is generally a white rectangular piece of cloth with primarily a red border on three sides and red woven motifs on the fourth (in addition to red, other colors are also used). Though it is used daily to wipe the body after a bath (an act of purification), the use is not restricted to this. It is used by the farmer as a waistcloth (tongali) or a loincloth (suriya); a Bihu dancer wraps it around the head with a fluffy knot. It is hung around the neck at the prayer hall and was thrown over the shoulder in the past to signify social status. Guests are welcomed with the offering of a gamosa and tamul (betel nut) and elders are offered gamosas (bihuwaan) during Bihu. It is used to cover the altar at the prayer hall or cover the scriptures. An object of reverence is never placed on the bare ground, but always on a gamosa. One can therefore, very well say, that the gamosa symbolizes the life and culture of Assam. The word gamosa is derived from the Kamrupi word gaamasa (gaama+chadar), the cloth used to cover the Bhagavad Purana at the altar. At par with Gamosa, there are beautifully woven symbolic clothes with attractive graphic designs being used by different cultural sub-systems and ethno-cultural groups as well. There were various other traditional symbolic elements and designs in use, which are now found only in literature, art, sculpture, architecture, etc or used for only religious purposes (in particular occasions). The typical designs of assamese-lion, dragon, flying-lion, etc were used for symbolising various purposes and occasions. Traditionally men folk of plains wear mill- made dhuties and small or big sized sola/fatua (shirt) and vest or eri-chaddar. In villages, rich men use headgear. They use japi (hat) while working in paddy fields. The young boys use dhuti, genji only on some occasions but they prefer using western dresses. The Assamese wear bare foot. The Assamese ladies enter the kitchen bare foot. The Assamese young boys use on occasion`s headgears with their gomacha, which they tie to their hip, especially when they are dancing in Bihu to cover the waist with the dhuti. Some young men use Khaddar clothes. AssamAssamese women use riha-mekhela-Sadar. The long flowing skirt up to the ankles is known as mekhela and the upper garment riha. The red coloured pattern at the end of the riha is graceful and symbolic.